2018 Fond du Lac Future 5 Award recipients: Taylor Moret, Society Insurance; Sadie Parafiniuk, Congressman Glenn Grothman; Larissa Clinard, J.F. Ahern Company, 2018 Young Professional of the Year; Ben Giles, Fond du Lac Family YMCA and Fond du Lac City Council; and Shavana Talbert, Fond du Lac School District. Larissa Clinard has been named Fond du Lac’s 2018 Young Professional of the Year by the Young Professionals of Fond du Lac (YPF), a program of Envision Greater Fond du Lac. The announcement was made during the organization’s annual meeting on Thursday, January 17 at Thelma Sadoff Center for the Arts. As one of her nominators stated, “Larissa does not solely strive for herself, but for the betterment of the industry and her peers. 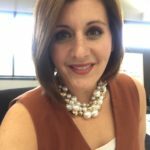 She truly is committed to succeeding in whatever she touches and leads other by motivating them to get involved and be part of something bigger.” As Fleet Manager at J.F. Ahern Company, she has paved the way for her career since joining the company in 2007. Professionally, Clinard is actively involved in the National Association of Fleet Administrators (NAFA) serving as the chair of the Wisconsin chapter and is involved in the NAFA Curriculum Development Committee, and NAFA Institute and Expo Curriculum Committee. Beyond her professional duties, she also serves on the steering committee for Fondy 100 Gives, is a redline triathlon club member, and active in YPF where she serves as the 2019 chair of the advisory council as well as being involved in the membership and Amazing Race committees. The Young Professional of the Year is chosen from the Future 5 award recipients, who are nominated as outstanding members in the industry and our community. In addition to Clinard, other Future 5 Award recipients included: Ben Giles, Fond du Lac Family YMCA and Fond du Lac City Council; Taylor Moret, Society Insurance; Sadie Parafiniuk, Congressman Glenn Grothman; and Shavana Talbert, Fond du Lac School District. 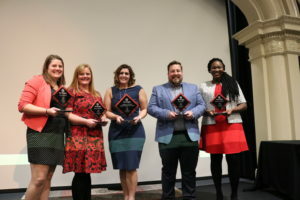 The Young Professionals of Fond du Lac, a program of Envision Greater Fond du Lac, established the Future 5 Award in 2013 as a way to support and recognize upcoming leaders in the community. This award is presented to a professional who has emerged as a community leader, demonstrated excellence, creativity and initiative in her/his business or profession and has made a positive impact on our community.